Well, it wasn’t the muffins. I’m quickly finding it difficult to focus on anything other than going into labor. I know- it’s only one day past my due date, but it’s amazing how minutes seem like hours. 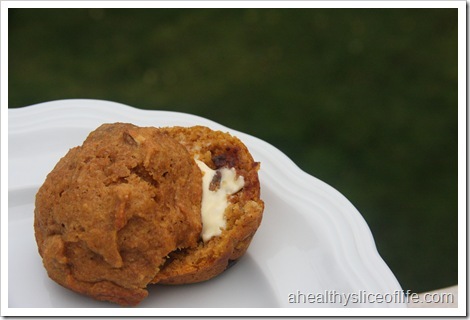 I had to try the pumpkin nut muffins, obviously, before I brought them to the nursing staff, so I ate two for breakfast, with a thin schmear (I love that word ;)) of Smart Balance Light Butter. Around noon-ish I guess I was somewhat hungry, and decided I should at something. 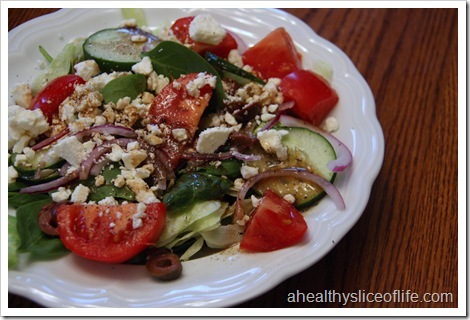 So I threw together a Greek salad on iceburg, spinach, tomato, feta, kalamata slices, cucumber, onions and Newman. Then I hit the road. I had to stay busy. Library, movie store, grocery store and Healthy Home Market to pick up some more Raspberry Leaf Tea. They had fresh BBQ in there that smelled sooooo good, I couldn’t resist some pulled chicken. The afternoon rolled by at a nice pace, and I decided I really needed to eat something else. 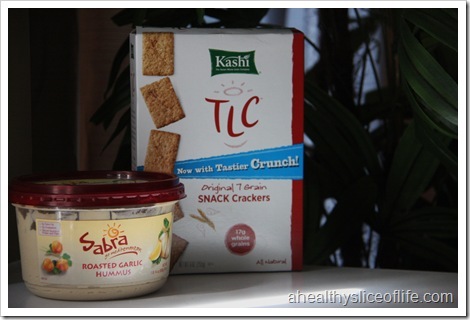 I mindlessly snacked on some hummus. and in hopes of giving spicy foods one more shot, some popcorn with Texas Pete. I popped in stove-top with a tbsp of oil. A little behind the scenes action for you… yes, I take pictures of food on the ground. it can be risky with this cute little fur ball around. I made my new, easy go-to meal. 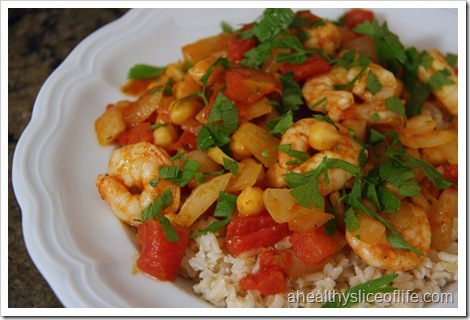 Shrimp and Chickpea Vindaloo over brown rice. Sprinkled with parsley. Parsley doesn’t only look pretty, it’s great for blood vessel strength, full of anti-oxidants and has twice as much iron as spinach. Just a fun food fact for ya! I know- everything is low, but like I said, I’m not doing it on purpose. My appetite is all weird now that I have baby brain like a crazy person. What is your favorite, easy, weeknight, go-to meal? My favorite weeknight meal is salad with some protein. I try to keep easy access salad fixin’s on hand so its easy to whip one up and get a good dose of nutrients in a short amount of time. Still waiting to see that “in labor” tweet!! I hardly wanted to eat during the last couple weeks either (especially after passing my due date). The husband kept filling me up with high calorie foods for the “task ahead.” I hardly wanted to touch any of it. I’m pretty sure the only way I now know “how to go into labor” is to set and induction date to guarantee that you will go into labor the night before you’re supposed to be induced and be completely exhausted. Hey worked for me 🙂 Can’t wait for you to have your little guy/gal! Brittany I love the pic of your belly, the chicken and the tea! Favorite go-to meal: scrambled eggs and a microwaved sweet potato! 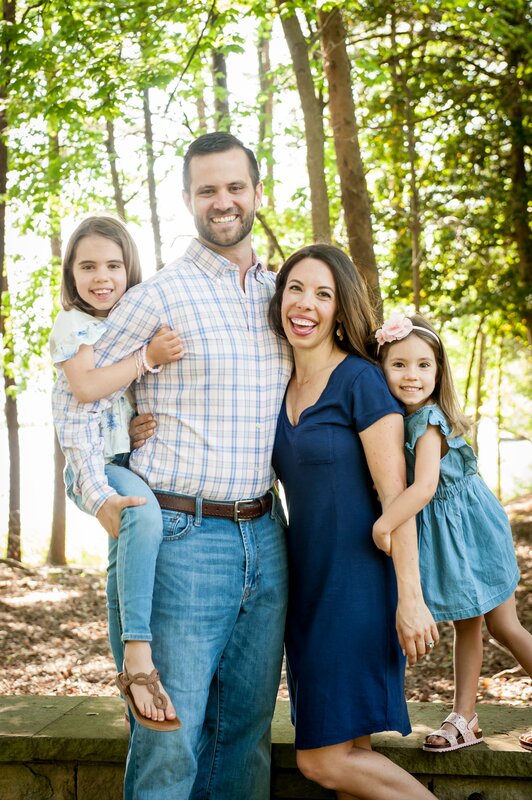 I had weird circumstances but after my water broke I went into full blown labor a week later, the day or 2 before though I had 0 appetite and then I started having contractions…no appetite could be a sign of labor starting! I was the same Emily, no appetite the days before I went into labor. I had to force myself to eat. Perhaps it’s a good sign!! ooooh your dinner looks soooo good! i need to make that. last night I had cottage cheese with a large tomato from the farm with a lemon cucumber on the side. I also wasn’t that hungry but man, that was SOOO tasty! 1. I love the word “schmear” too. I was in the middle of a conversation with someone the other day and he used that word in conversation just as naturally as can be, and I’m pretty sure I decided we needed to be friends after that. 2. I think I’m going to make you a labor-inducing dinner tonight. Eggplant + pineapple + spice, right? Sounds like an intriguing Indian-infused creation waiting to happen if you ask me. 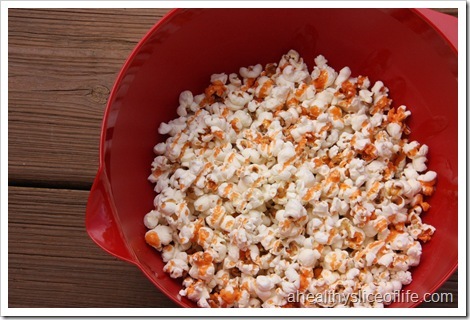 I love popcorn with hot sauce and spicy mustard – yum! OMG I can’t believe your past your due date … well there goes my guess in the poll 🙁 I’ll be thinking about you!!! Can’t wait to catch up and hopefully meet that little one once we get back! Love ya! The muffins look so amazing- so sweet that you are bringing them to the nurses! I have been thinking about you- looking forward to hearing the good news! 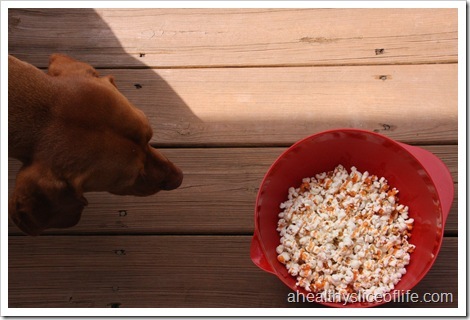 Popcorn with Texas Pete ! ? Holy Shmoly I have got to try this! I put texas pete on just about anything I can! AMAZING! I so wish Baby D would make his or her appearance already 🙁 I can’t imagine how uncomfortable and ready you must be! I doubt I’d be able to eat much either. And boo the muffins didn’t work…yet. Hope to hear you’re in labor SOON! Great tip on the Parsley! I had no idea it had so much iron. My fave go-to meal is usually pasta with meat sauce. Depending on how I make my marinara, it can come together pretty quickly. 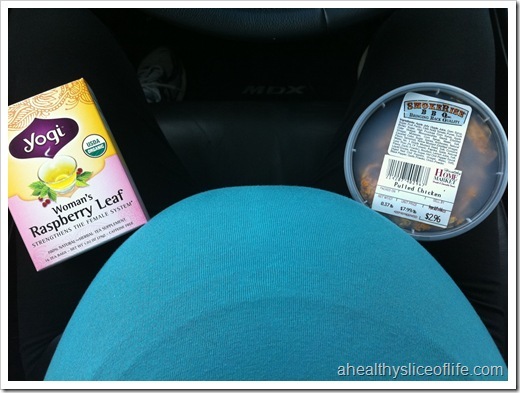 Maybe you’re eating less because you’re body’s making more room for the baby to come out? I hope so! 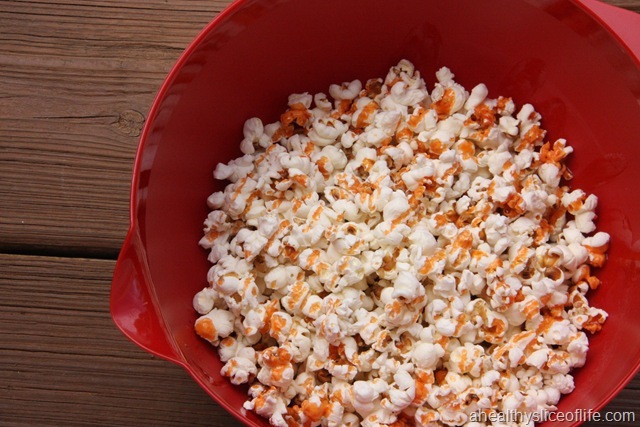 popcorn with hot sauce is my favorite!! Good luck getting that baby out! I HAD NO IDEA about parsley! good to know! praying baby D makes an appearance soon. YAAAYYY for being… ANY MINUTE now!